A group of seafaring explorers stocked up for their planned record-breaking sailing excursion at a beloved Newport Beach sailing supply store. NEWPORT BEACH — Newport Beach’s Minney’s Yacht Surplus, considered to be royalty within the local boating supply scene, hosted a very special guest leading into the weekend of March 9 – a crewmember from a rag-tag group of modern sailors known as the Sea Gypsies. The Sea Gypsies are a sailing community who navigate the world aboard their vessel, Infinity. Collectively they make up Infinity Expedition and have sailed the seas since 2004. Infinity Expedition, as it turns out, is embarking on one of its most daring expeditions yet: As you read these words, the Sea Gypsies are attempting to sail farther north than any ship in recorded history. A white, snow-capped no-man’s land, the Sea Gypsies will battle Mother Nature’s natural elements as they foray into a mostly unexplored territory through the Northern Pass. Such an endeavor would certainly qualify as a trip even the most experienced sailors and rugged outdoorsmen would not endeavor lightly. However, with Capt. Clemens Oestreich at the helm, the Sea Gypsies are determined to break the sailing record. Oestreich is a European native and an experienced sailor. Ernie Minney, the owner and founder of Minney’s Yacht Supply, told The Log Infinity Expedition purchased “thousands of dollars” worth of inventory to stock up for the planned northern excursion. A crewmember named Grace camped out on his premises for about four days, Minney added. Minney had the chance to interview Grace and posted a video of the conversation online. The video can be found on YouTube or the blog section of Minney’s Yacht Surplus official website. In the video, Minney narrates as he records Grace packing up boxes and boxes of supplies said to be leaving in a container from Long Beach and shipped to the Marshall Islands. Infinity is crewed by a close-knit family of 20, including children. The Infinity website features a section dedicated to the crew, providing personal background and explaining the quirkier parts of their character. Infinity’s crew is not exclusive. 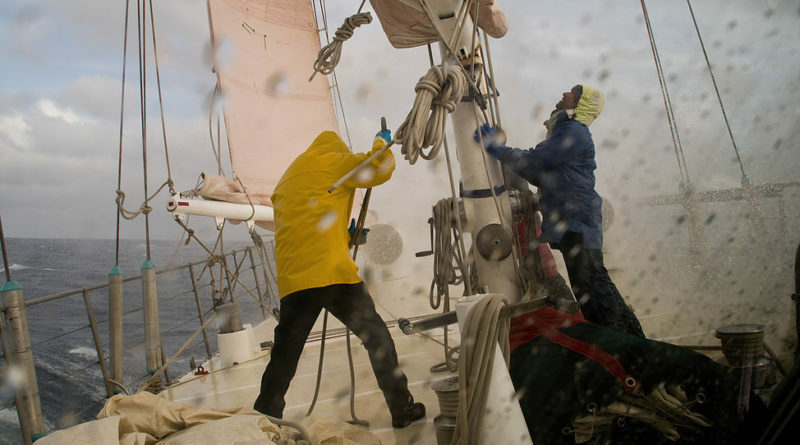 The bravest explorers could also join the crew in a work-trade agreement. The one-time membership costs 1,200 Euros. A meal plan, which includes basic vegan fare, costs 20 Euros a day. Fuel for the ship is also included in the daily costs. The Log was able to contact Oestreich despite Infinity currently navigating in regions not as easily accessible by phone or email. Oestreich said when Infinity Expedition launched in 2004 in San Diego a friend recommended he give Minney’s a try. The purchased provisions will join the Infinity crew at the Marshall Islands, where the Sea Gypsies will then turn north and head toward the Arctic. In a culmination of a bold and fearless journey, Oestreich hopes Infinity Expedition will be able to stage a special event. “We will also stage an event on the northern ice cap aiming to inspire people to change for a sustainable common future on our communal spaceship, Earth,” Oestreich continued. The local boating legends at Minney’s Yacht Surplus wish the Sea Gypsies well on their next epic adventure after doing their part to ensure they are looted up for the upcoming months traversing up towards the northern caps of the earth. For those who crave nautical voyages beyond the typical, those of Infinity Expedition are hard-pressed to be beaten. The trailer for the film, “Sea Gypsies — The Far Side of the World,” can be viewed on their website. Minney, who mentions he is a fan in his YouTube video with Grace, stated he owns and watches the film regularly. To view more information about Minney’s Yacht Surplus and all the boating goodies there, visit the website at minneysyachtsurplus.com. To learn more about the Sea Gypsies, including watching their movie trailer and getting the latest updates on their travels, visit their websites at infinityexpedition.org and seagypsiesmovie.com.